I was at a digital media conference last week, and one of things that was mentioned is that Wikipedia is probably the first source of information people use in looking for any topic. There is also a general assumption that wikipedia unreliable, it has in recent years made moves to correctly insist on correct citations for the information on the site. Last year the British Museum had a Wikipedian work on site for 5 weeks to improve the standard of articles relating to objects in its collection. The Brooklyn Museum embraced wikipedia with it’s seductive subversive wikipedia work and Imperial College London have been in the news in the last day or so and they too are starting to embrace Wikipedia. The start of the visitor journey? 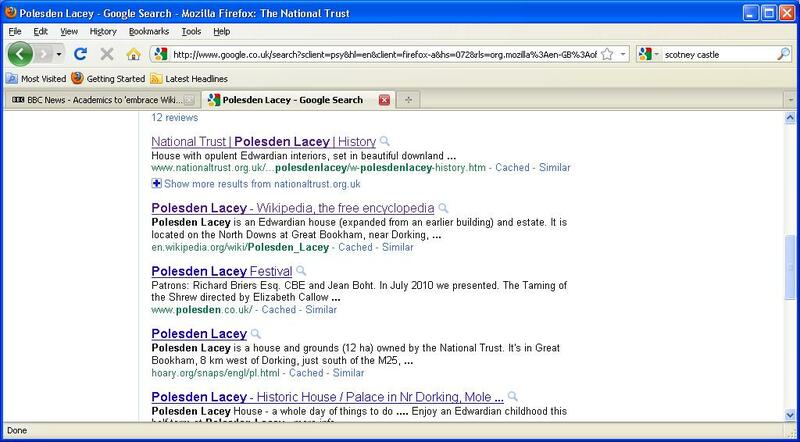 Our National Trust website is top but Wikipedia is 2nd. Which do people click? The visitor journey framework is often used in talking about the overall visitor experience, our websites are often the first place we assume people visit who want stimulation or planning information. However where does a visitors journey really start? With Wikipedia’s growth as not only a search result but a developing reputation for a source for a quick and general information on any topic. Wikipedia has perhaps become one of the first places where a visitors journey really starts? Wikipedia is here to stay and with a readership of 365 million per month it may very well the best place to start if you want to engage an online audience.